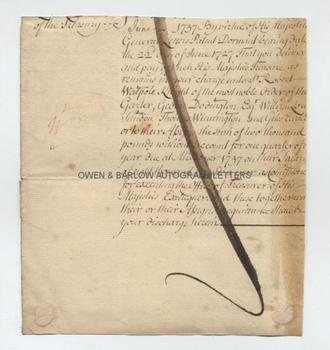 Part of a treasury document, signed by Sir Robert Walpole and also by George Bubb Dodington (1691-1762) later Treasurer of the Navy, Thomas Winnington (1696-1746) First lord of the Admiralty and William Clayton, Baron Sundon (1671-1752). A receipt for £1,600 dated 30th June 1737. With the majority of the text remaining on the verso. On treasury paper. Approx 7.25 x 6.5 inches. A little trimmed at edges with slight losses to some words but not touching the signatures. Some browning and mounting traces to verso. Very good. 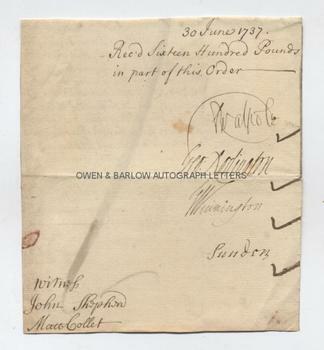 The receipt is for part payment of a salary of £8,000 per annum payable to Walpole and the other signatories for executing the office of Treasurers of the Exchequer. The signatures are witnessed by John Shepherd, a deputy minister of the Treasury, and Matthew Collet, principal Bank Clerk for the Exchequer. These were two of the witnesses in the Committee of Secrecy's enquiry into the conduct of Sir Robert Walpole during his last 10 years as first Commissioner of the Treasury. This concerned the misuse of public money and allegations of corruption in appointments made and payments made to those in office. There was widespread concern that Sir Robert Walpole had plundered the Treasury and had gained enormous wealth for himself and those of his favourites whilst carrying out the office. (See William Cobbet's Parliamentary History of England . Volume 12. 1812. pp788-827).